The long-finned pilot whale (Globicephala melas) is a medium-sized whale with an elongated body, bulbous forehead and a short, almost imperceptible, beak. In mature males, the rounded forehead overhangs the snout. The mouth-line is curved upwards and the crescentric blowhole is set slightly to the left of centre on the top of the head. The dorsal fin is prominent and falcate, with a low profile and long base, and is located relatively far forward on the back (about a third of the way back from the head). In adult males, the dorsal fin may have a thicker leading edge and rounder form than in females. Flippers are long and slender, with pointed tips and an angled leading edge forming an ‘elbow’. The tail stock has a thick keel. Tail flukes are pointed at the tips with a concave trailing edge and a deep median notch. Long-finned pilot whales occur in some temperate and sub-polar oceans and are usually found in deep, offshore waters, although they may be seen in coastal waters in parts of the North Atlantic Ocean. They are often found along the edge of continental shelves, since they prefer deep water. The US east coast continental shelf-edge has been identified as a high use cetacean habitat, and surveys have shown that pilot whales are a principal species of the cetacean assemblage in those waters. 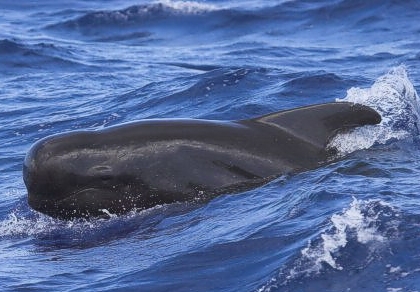 There are two distinct populations of long-finned pilot whales, one in the Southern Hemisphere, associated with the Humbolt, Falklands and Benguela Currents, and another in the North Atlantic. They are geographically separated by the wide tropical belt and may form different subspecies or even species. Seasonal movements seem to occur in some areas (as pilot whales follow the movements of their principal prey, squid), although long, well-defined migrations have not been documented for these whales. Some pilot whales live permanently offshore or inshore, and others make inshore movements in summer and autumn and move offshore in winter and spring according to the abundance of squid. There is currently no evidence to suggest the existence of resident populations. Male long-finned pilot whales may attain lengths of over 6 m, and females can reach over 5.5 m in length and weigh up to 2.32 and 1.32 tonnes respectively. Sexual dimorphism is clear: mature males are up to a metre or so longer than females and almost double their maximum weight. Female long finned pilot whales become sexually mature at about 7 to10 years of age and at a body length of 3 to 4 m. Males mature at a greater age, 11 to 16 years and a length of about 5 m. Males may become socially mature and mate successfully some years after this. The sexual activity of males (off the Faroe Islands) peaks between March and August and is low between December and February, but it is likely that adult males are capable of breeding throughout the year. Mating may take place all year round, but conceptions peak in April to June, with a possible second peak in September. Few conceptions occur between November and December. The gestation period is thought to be around 12 months. Lactation is estimated to extend for about 3.4 years, although calves of at least 4 years old have been found with stomachs containing milk, and tiny traces of milk have been found in the stomachs of animals of up to 12 years of age. There may be a post-reproductive phase in some female pilot whales, which can begin relatively early in the female life-span (at about 28 years), although it is more likely to occur between 40 and 50 years of age (females can reach over 60 years of age). Cephalopods form the bulk of the diet of the long-finned pilot whale, but fish and crustaceans are also eaten. Prey are mainly oceanic, mid-water pelagic shoaling species, and most of the squid species preyed upon are luminous; luminosity presumably aiding whales feeding at night. Two species of squid have been found to be dominant in the diet, Todarodes sagittatus and Gonatus sp, although diet has been shown to vary between years and according to body size and reproductive status. From knowledge of the prey species, it is inferred that pilot whales are able to forage at a wide variety of water depths, commonly between 100 and 500 m.
Pilot whales are extremely social. Pods of pilot whales range in size from less than ten to more than 1,000 individuals, although they are generally found in groups of 20 to 100 animals. Herds observed in the open ocean tend to be smaller than the herds of animals stranded or driven ashore, and herd size is thought to vary depending on various circumstances such as feeding, environmental stress and migrations. At times, smaller units may aggregate to form temporary larger groups; as has been demonstrated in other social cetacean species during seasonal movements, foraging, and breeding activities. Observations off free-ranging pilot whales suggest that feeding generally takes place at the same time as active surface behaviour. Greater click activity has been heard underwater when gulls are associated with groups of active pilot whales. Clicks have long been implicated in echolocation, and in captive dolphins feeding is characterised by fast, intense continuous clicking. Pilot whales feed co-operatively - requiring a high degree of co-ordination between group members - communicating with whistles when moving at high speeds.